The word Scapular comes from the Latin scapula [meaning an arm, shoulders, and back] and is made of two small pieces of cloth joined by strings. It is worn under the clothes by us Roman Catholics as a sign of our religious devotion and is one of many Sacramentals. In the Middle Ages, when many lay people wished to participate in some way in the spiritual life of religious orders, associations, such as confraternities, were established. The vesting of the Scapular identified members accepted into the spiritual community of various religious orders. The role of the Scapular in the history of the Church is similar to that of the Rosary: it is one of the oldest and most popular forms of devotion to the Most Holy Virgin, who gave it to us as a means of sanctification and salvation, thus the title of Sacramental. The Scapular represents the external garment which Mary places over her children as a sign of trust that Our Lord Jesus and Our Lady shower those who wear it with graces and protect them in many ways against temporal and spiritual evils. With the Church's blessing, those who wear it assume important and serious obligations focused on prayer, devotion, trust, and dedication to the Mother of God. 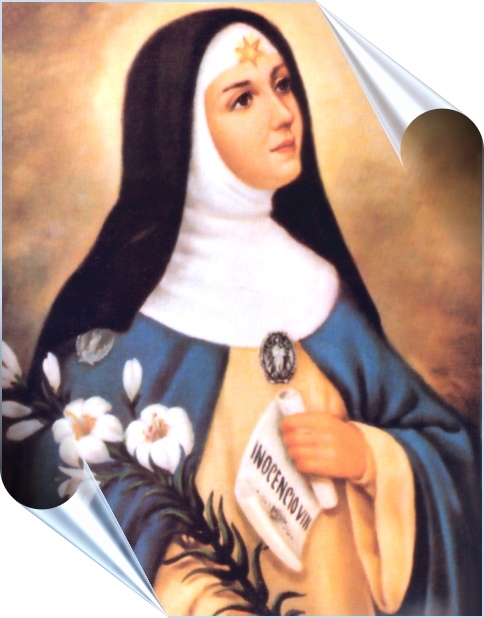 The Blue Scapular originated in Spain and is connected with Saint Beatrice da Silva Menesses (1426-1492), a Gstercian nun. In 1484, she founded the Order of Franciscan Sisters of the Immaculate Conception of the Most Blessed Virgin Mary [Conceptionists]. One of the requirements of the Rule of Life for these nuns was to wear the Scapular of the Immaculate Conception beneath their white habits. The growing popularity of this form of devotion to Mary among the faithful encouraged the Conceptionist Sisters to approach the Holy See with the request for special indulgences and privileges for all those who piously wore their scapular. A century later, the practice of wearing the Scapular of the Immaculate Conception began to spread in Italy. There, the Venerable Servant of God, Ursula Benincasa [1547-1618], founded the Congregation of Oblates of the Immaculate Conception of the Blessed Virgin Mary in the year 1583. In Naples, Italy, after receiving Holy Communion on the Feast of the Presentation of the Lord in 1617, Sister Ursula received a vision of the Blessed Mother clothed in a white garment over which she wore another garment of azure blue. 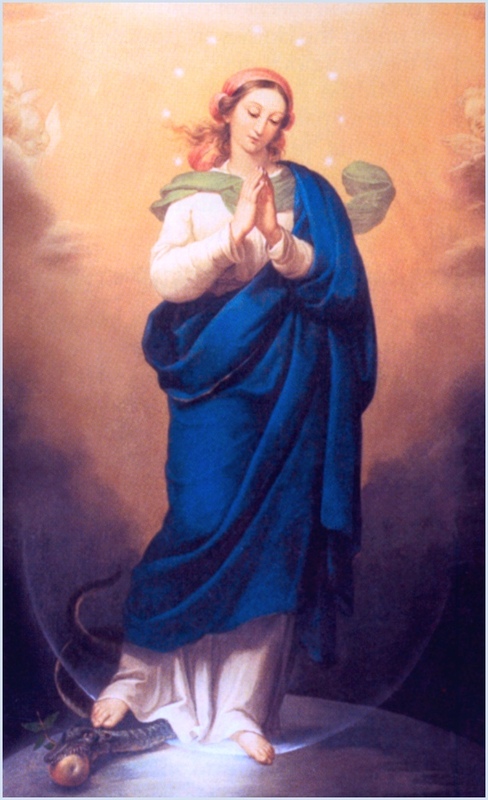 [The Scapular of the Immaculate Conception has since traditionally been made of blue cloth, thus, it is called the "Blue Scapular."] In her arms, Mary held the Infant Jesus. She was surrounded by many people, all attired in a similar manner. The Blessed Mother addressed Sister Ursula with these words: "Cease weeping, Ursula, and change your sighs into heartfelt joy. Listen attentively to what Jesus, Whom I am holding in my lap, will say to you." Then Jesus revealed to Sister Ursula that she would found a convent where 33 nuns would live a life of solitude and seclusion and be dressed in the same attire as the Blessed Virgin Mary of her vision. The Savior promised many special graces and spiritual gifts to those who would zealously follow this way of life. From 1633, Sister Ursula's community accepted the title, Theatines of the Immaculate Conception of the B.V.M. In 1910, Pope Pius X gave his permission for substituting the blue cloth scapular with a medal. On the face of the medal, there should be an image of Our Lady of the Immaculate Conception; on the reverse side, there should be an image of the Sacred Heart of Jesus. Both the cloth and medal scapulars should be worthily worn both day and night. The Congregation of Marians of the Immaculate Conception of the B.V.M., like the Conceptionist Sisters, wore the scapular under their white habits. Obliged by their vocation to spread devotion to Mary's Immaculate Conception, they also wished to propagate the scapular among the faithful. In 1681, Pope Innocent XI granted the founder of the Marians, the Venerable Servant of God Father Stanislaus Papczynski, the privilege of establishing Confraternities of the Immaculate Conception of the B.V.M. at Marian churches. Communion on the day of investiture. Upon acceptance into the Confraternity, all Members receive a special certificate confirming their membership, and their names are recorded in the Registry of the Confraternity at the Marian Helpers Center in Stockbridge, Massachusetts. Those who wear the Blue Scapular declare solemnly that they want to dedicate their lives to God alone, just as Mary did, by participating in the spirituality and privileges of the Theatine and Marian orders. Although lay people accepted into the Confraternity are not obliged to abide by the strict disciplines of these religious orders, they are obliged to avoid sin and to live in union with God with Mary Immaculate as their model. Participate in and support the spirituality and work of the Congregation of Marians through prayer and alms and pray for good, holy Marian vocations. + Recite [daily, if possible] The Chaplet of the Ten Evangelical Virtues of the B.V.M., or The Little Office of the Immaculate Conception of the B.V.M. *At the moment of death. Kissing the Blue Scapular or medal carries a partial indulgence granted by the Church. Members of the Confraternity of the Immaculate Conception receive a share in all the spiritual benefits of the Order of the Clerics Regular [the Theatines] and of the Congregation of Marians, both during their lifetime and after death. The Marian priests and brothers exclusively remember all Members of the Confraternity on the 8th day of each month at the National Shrine of The Divine Mercy, commemorating the Feast of Mary's Immaculate Conception which is celebrated on December 8th. In addition, all Confraternity Members are remembered in daily Mass, a special Mass offered on First Fridays and First Saturdays and on Feast Days of Our Lord and Our Lady, in the rosary, and in the continuous Novena to The Divine Mercy. The picture of the Immaculate Virgin Mary above was commissioned by the Marians and painted by Franciszek Smuglewicz [1745-1807]: It was placed in Saint Vitus Church in Rome, Italy, in December of 1781 which was the property of the Marians at that time. This prayer, contained in the Rule of the Ten Virtues of the Blessed Virgin Mary, has been passed on by tradition in the Marian Order. It is meant for private recitation on the Rosary. First we make the Sign of the Cross and recite one Our Father, followed by ten Hail Marys. V. In thy Conception, O Virgin Mary, thou wert Immaculate. R. Pray for us to the Father, Whose Son, Jesus, thou didst bring forth into the world. Father, Thou didst prepare the Virgin Mary to be the worthy Mother of Thy Son. Thou didst let her share beforehand in the salvation Christ would bring by His death and kept her sinless from the first moment of her Conception. Help us by her prayers to live in Thy presence without sin. We ask this in the Name of Jesus the Lord. R. Be our health and protection.